Building markers may be fun for hikers, but the cairns' proliferation disturbs the natural beauty of the trails and may send inexperienced visitors astray. 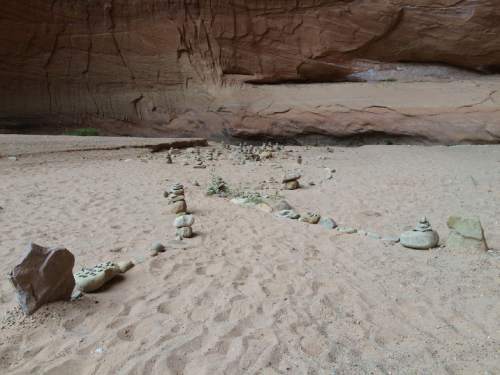 Kristen Moulton | The Salt Lake Tribune Visitors use rocks and pebbles to create whimsical art on the red-sand beaches of Coyote Gulch, south of Escalante, Utah, in late May 2015. Kristen Moulton | The Salt Lake Tribune Visitors use rocks and pebbles to create whimsical art on the red-sand beaches of Coyote Gulch, south of Escalante, Utah, in late May 2015. 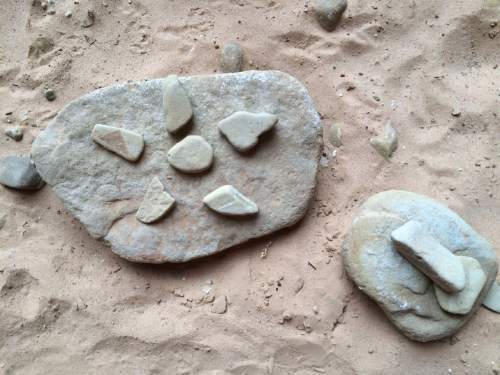 Kristen Moulton | The Salt Lake Tribune Visitors use rocks and pebbles to create whimsical art on the red-sand beaches of Coyote Gulch, south of Escalante, Utah, in late May 2015. Kristen Moulton | The Salt Lake Tribune Visitors use rocks and pebbles to create whimsical art on the red-sand beaches of Coyote Gulch, south of Escalante, Utah, in late May 2015. 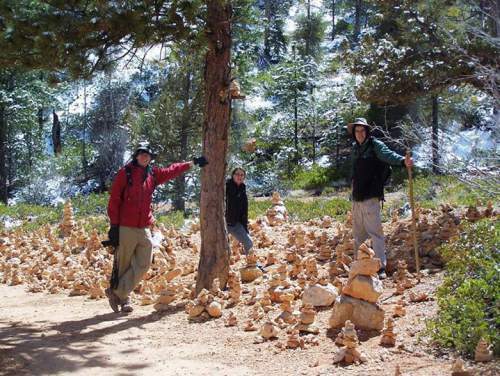 Courtesy | Riley Rackliffe Hikers pose for a picture beside a cairn garden in Queen's Garden area of Bryce Canyon. Courtesy | Laura Smith Kasmer Cairns alongside a well-marked trail in Coyote Gulch, Escalante. Courtesy | Tom Schilling A field of cairns sits along the trail to Corona Arch near Moab in May 2015. Courtesy | Tom Schilling A field of cairns sits along the trail to Corona Arch near Moab in May 2015. Kristen Moulton | The Salt Lake Tribune Visitors use rocks and pebbles to create whimsical art on the red-sand beaches of Coyote Gulch, south of Escalante, Utah, in late May 2015. Scott Sommerdorf | The Salt Lake Tribune A cairn left behind by some intrepid climber or explorer at Storm Mountain, Sunday, October 12, 2013. Francisco Kjolseth | Tribune File Photo A long line of visitors stretches out along the sandstone as people make the three-mile round trip to one of Utah's most famous icons, the famed Delicate Arch in Arches National Park in late May 2013. Some of Earth&apos;s most inhospitable landscapes are also the most difficult to navigate. The tundra, the grassy plain and the redrock desert all stretch toward the horizon with few identifiable features to mark trails or respite. Having been conquered by humans, all now are dotted with crude waymarkers of stacked rocks called cairns. Some of the stone piles have weathered centuries. Others, not nearly so long. 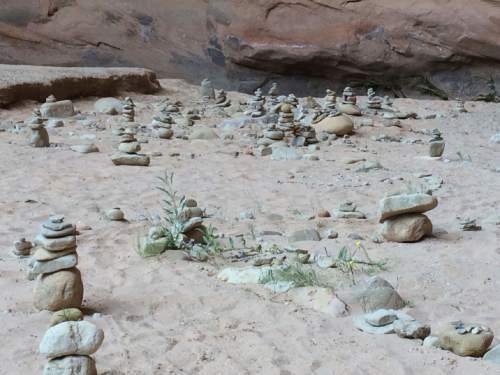 And in Utah&apos;s redrock country, public land managers say, the modern proliferation of cairns has outpaced their usefulness  sending hikers astray, multiplying in whimsical but useless "cairn gardens," and, in some cases, being used to help looters find American Indian archaeological sites. "It&apos;s a ubiquitous practice," said Megan Crandall, spokeswoman for the Bureau of Land Management in Utah. "It&apos;s been used to mark trails for a very long time and, as recreation has grown … now we&apos;re starting to see cairns used inappropriately." 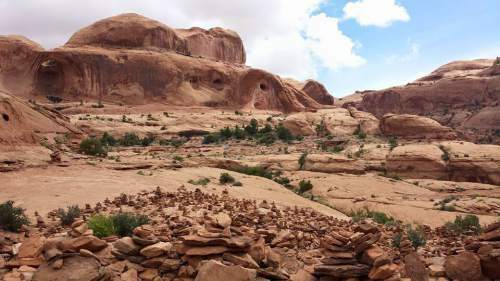 The problem isn&apos;t as widespread in Utah as in Arizona, where popular trails and locales can, to the dismay of wildlands activists, appear to grow stacked stones like bacteria in a petri dish. But in the southeastern part of Utah  and especially in popular recreation hot spots, including Arches and Zion national parks  cairns have become omnipresent. Rangers in Zion already dismantle the rock piles. The BLM is launching a campaign this week to discourage cairn building. It&apos;s a case of too much of a good thing becoming a bad thing. While cairns are useful for marking trails  the BLM, the U.S. Forest Service and some national parks use their own ranger-built cairns to mark difficult backcountry trails, particularly in redrock country  Crandall and other officials say some areas have collected so many cairns that the multiplying piles have started to confuse hikers and tourists. "After a long day, all cairns start to look the same … and that can lead to real trouble," Crandall said. "People have to remember that southeastern Utah is an unforgiving environment. Taking a wrong path can lead to disaster. "Cairn construction is a bad idea, and we discourage it." It&apos;s not just the BLM. 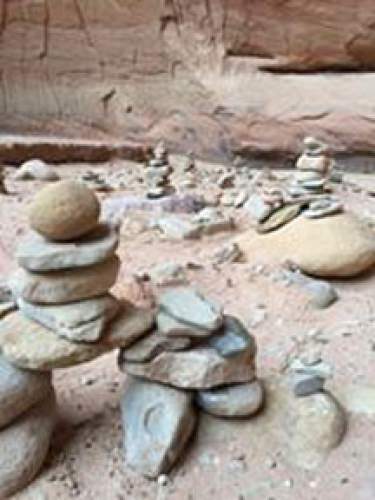 In Zion National Park, as in many other national parks, the unauthorized construction of cairns is prohibited. "Creating cairns moves rocks into unnatural formations," said Aly Baltrus, chief of interpretation and visitor services at Zion National Park. "The park&apos;s mission is to provide and protect its resources unimpaired for future generations. With a visitation of more than 3.2 million people annually, people need to stop &apos;leaving their mark,&apos; or Zion will be loved to death and will be a very different place for future generations." The park doesn&apos;t use cairns to mark trails, Baltrus said. But that hasn&apos;t stopped tourists from lining some popular trails, such as the Narrows or the Left Fork on the Virgin River. In those areas, where Baltrus said paths are well marked by other means, cairn building seems to have become something of a recreational pastime for some visitors. "It&apos;s almost a graffiti-like thing, where they just build a bunch of cairns," she said. 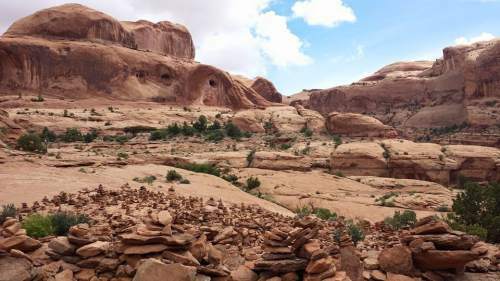 In other parks, including Arches and Canyonlands, where cairns are used to mark trails, the construction of unauthorized cairns poses a real danger to visitors, said Kevin Moore, acting chief ranger for both parks. "Our cairns at the parks are for designating trail paths," he said. "Some problems we see are cairns that lead off on social trails, or mislead other visitors with cairns that really go nowhere and get people off the main trail." 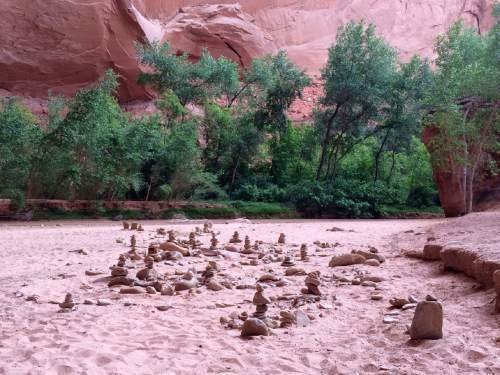 Arches and Canyonlands rules discourage guest-made cairns to avoid the confusion, Moore said. "We don&apos;t expect visitors to build cairns," he said. "We have standards for our cairns and determine the distances between cairns and how high they should be." Not all the unauthorized cairns appear to be associated with trails, Moore said. "We have visitors who will stack cairns and make monuments out of them, which is not really appropriate for the park," he said. Some are building cairns to support criminal activity. Crandall said the BLM has had trouble with rock piles constructed to mark protected archaeological sites so that the builders can return later for looting. In any case, public land managers say, the cairns must come down. Zion, Arches, Canyonlands and the BLM all make cairn removal a matter of routine. Recently, Crandall said, the BLM sent three rangers and an archaeologist to remove a large cairn in Mule Canyon. The cairn was so large, she said, that a sizable bat was found nesting inside. Removal of the rock piles frustrates some hikers and trail runners, who say the cairns are an important means of navigating backcountry terrain. Cairns are helpful in areas where trails can be difficult to pick out and the piles don&apos;t disturb natural vistas or damage the environment, said Riley Rackliffe, an avid hiker from South Jordan. "I think they are great," he said. "They do near zero damage to the environment. They are easy to build and easy to remove  far better than using plastic signs or whatever as a trail marker. In terms of &apos;leave no trace,&apos; they are better than anything else I&apos;ve heard of, aside from closing the trail." 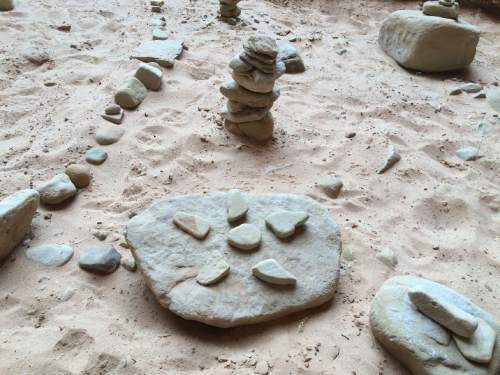 Rackliffe said he was aware of a movement to build large numbers of cairns in locations including the Queen&apos;s Garden, a cairn garden located in Bryce Canyon. While he was bewildered by the practice and didn&apos;t necessarily approve, Rackliffe said he didn&apos;t see any harm in it, either. "I could see it ruining the experiences of other hikers," he said. "But I think there are probably more people enchanted by the areas than people disturbed by them, particularly children." But not all hikers agree. Denise Traver, a professional guide and travel writer from Arizona, said she has first-hand experience with rounding up hikers misled by cairns. Between the confusion they create and the fact that they draw looting and vandalism, Traver said, she can&apos;t see what good could come from cairns. "It&apos;s just awful," she said. "There&apos;s no way to say that this is a positive thing for anybody, or for future generations that want to go see an unblemished site." Traver believes the people who build cairns are mostly novice hikers who can&apos;t be bothered to learn to find or follow a trail through the wilderness. She said most cairns were probably built by people who thought constructing a cairn would make the trail less difficult to follow in the future. But if they had difficulty following the trail, they probably aren&apos;t the right people to be marking it, she said. Overall, Traver said, cairns are a clunky sign of civilization intruding into the wilderness. "Do you want all wilderness taken out?" she asked. "Do you want to not have to learn how to do any kind of road finding?" Traver said she occasionally dismantles cairns when she encounters them. However, both the BLM and the parks service discourage visitors from knocking over cairns on their own. Some cairns are built by the rangers themselves, Crandall said, and others may be archaeological in nature. And there are some cairn gardens  such as one near Corona Arch  that have more or less been sanctioned by the BLM. 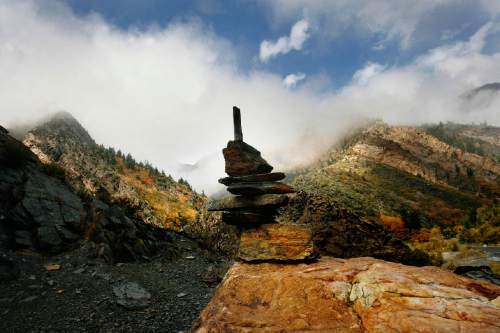 The BLM does ask that visitors refrain from adding any additional cairns, she said, but encourages guests to enjoy the "creative landscape" that already exists. When hikers do encounter cairns they believe may be unauthorized, Crandall said, they should report their finding to the nearest ranger, gate or visitor center so that the responsible agency can evaluate the site and, if necessary, remove them.